2. Why bother with an exerciser? Confinement in a crib or playpen seldom satisfies an action-seeking pre-toddler for long. The first choice of every baby is mother's attention or dad's bouncy knee. After that, there's the floor, but it doesn't respond very well. Your growing baby needs to develop good muscle tone, balance, co-ordination and self-confidence while practicing his motor skills. 3. At what age can I put my child in the Original Jolly Jumper baby exerciser (with door clamp)? Babies can use their Jolly Jumper Exerciser as early as 3 months (ONLY IF BABY CAN HOLD HEAD UP WITH FULL NECK SUPPORT) to walking age, with baby's maximum weight of 28 lbs (13 kgs). This is only possible because the unique Jolly Jumper saddle has elastic sides which hold the baby's back firmly in place while exercising. Wait until your baby is older and the spine is further developed to use products such as baby walkers which require them to support their own weight. Jolly Jumper is the original baby exerciser. It has been used in homes and hospitals around the world since it was first developed in 1958 and continue to be recommended by doctors, paediatricians, fitness experts and parents alike. All key components are manufactured to meet or exceed stringent standards. 5. How long should I allow my baby to exercise in the Jolly Jumper? This can vary with each baby. As the Jolly Jumper is the first opportunity for the practiced kick to produce real movement, 15 minutes at a time for babies, twice daily is acceptable. However, babies will usually decide when they have had enough. During these exercise sessions you can be confident your baby is safe and happy while you enjoy a play session or quiet break with each other. 6. Do I need a door frame to use a Jolly Jumper exerciser? A door frame is absolutely necessary for use with the Original Jolly Jumper with Door Clamp; however a Jolly Jumper with Stand is also available and this exerciser does not require a door frame. 7. What kind of a door frame do I need for use with the Original Jolly Jumper Exerciser with Door Clamp? 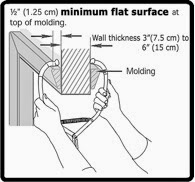 The door clamp may be used ONLY on frame openings as shown on the illustration below. Wall thickness should have a MAXIMUM thickness of 6 inches or 15cm with frame mouldings having a flat top surface of NO LESS THAN 1/2 inch or 1.25cm. 8. I have a relative who is giving me their Jolly Jumper baby exerciser that they bought over 2 years ago and used with their child - can I use it for my baby now? Jolly Jumper warranties Jolly Jumper Exercisers to be free of defects in material and workmanship for a period of two years from the date of original purchase at retail. We do not recommend using second hand products with your baby. As with most products, normal wear and tear is to be expected and we cannot guarantee that the item continues to meet all safety requirements. 9. Can my baby bounce in the Jolly Jumper while I'm not in the room? No. We recommend that you never leave baby unattended. If you have to leave the room for any reason, take baby with you. 10. Is the Jolly Jumper saddle washable? To wash without having to detach the webbed straps, we suggest that the saddle with attached straps be placed inside a knotted pillowcase. Machine wash in cold water. Do Not Bleach. Tumble Dry, Low. 11. How do I maintain my Jolly Jumper to keep it safe? Lubricate the swivel snap periodically and check all components before each use. 12. I have a Jolly Jumper with Stand. Can I buy the door clamp separately and convert it into a Jolly Jumper Original (the one that hangs from the door frame)? No. Parts on these two products are not interchangeable. Welcome to Jumping Baby Jacks! Shipping fee is RM6 for items below 500gm, RM10 for total items below 7kg and RM12 for total items between 8 to 10 kg within Peninsular Malaysia. Please email us for shipping rates to Sabah, Sarawak and other areas. Jumping Baby Jacks is an online store, based in Malaysia, aimed at providing quality baby toys and equipments at affordable prices bringing convenience to parents. Inspired by the birth of our nephew, our focus is to bring in toys and equipments that are healthy and safe for the development of your babies and to share products that we have enjoyed and loved. As we continue to grow, we appreciate feedback and constructive criticism to constantly improve our services and to expand our product range. Blog contents © Jumping Baby Jacks 2013 | 2014. All rights reserved. Blogger Theme by NymFont.